See Google Help for more information." Google Help suggests that I may be running some sort of malware, despite my keeping Windows up to date, I have MSE, SuperAnti-Spyware, Malwarebytes Ant-Malware and Spyware Blaster. Did a Hijackthis scan, and removed one file after submitting the log to your detective program, but after rescanning, the program tells me there's something weird going but can't seem to tell me what. O4 - HKLM\..\Run: [Immunet Protect] "C:\Program Files\Immunet\3.0.4\iptray.exe"
mRun: [LifeCam] "C:\Program Files (x86)\Microsoft LifeCam\LifeExp.exe"
mRun-x64: [LifeCam] "C:\Program Files (x86)\Microsoft LifeCam\LifeExp.exe"
10:20:48.508 Disk 0 MBR has been saved successfully to "C:\Users\Christopher King\Documents\MBR.dat"
10:20:48.512 The log file has been saved successfully to "C:\Users\Christopher King\Documents\aswMBR.txt"
Oh well, it's the only one that I'm not able to. I get the same thing when I go to the link provided must be a google or the sites problem. I was wondering if you can burn CD's and have access to a Usb Flash Drive? I would like to Get a copy of your MBr to check? I do burns DVDs on occasion, as well as having a USb drive. What is it you need exactly, and how would I get it? Try this please. You will need a USB drive. Type in: dd if=/dev/sda of=MBRbackup.zip bs=512 count=1 and hit Enter. MBRbackup.zip should be created on your flash drive, please attach it to your next reply. Followed your direction with the downloads and installation to the USB, but when I rebooted and hit the F12 to boot from USb, nothing happened. Cursor just sat there and blinked at me. How long is the bootable OS supposed to take before it commences? It should be instantly. 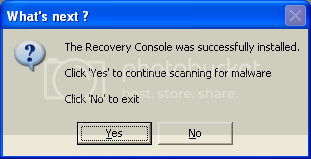 If it still doesnt work go ahead and delete and reformat the usb drive and try it again. but when I rebooted and hit the F12 to boot from USb, nothing happened. Did you choose to boot from USb device?